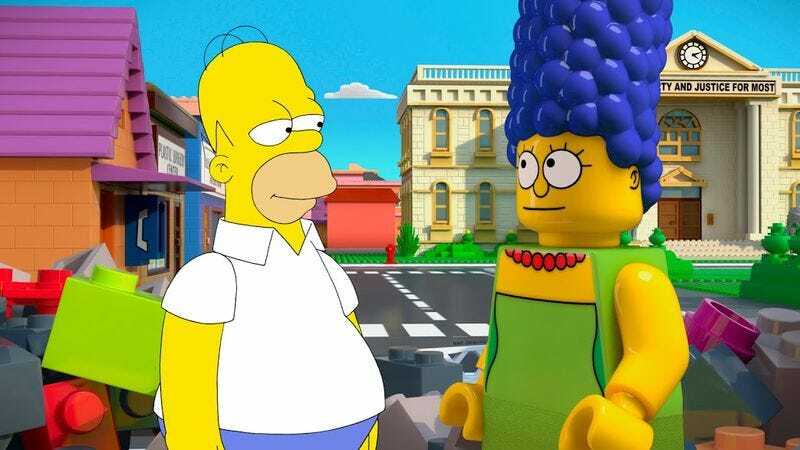 The Simpsons: "Brick Like Me"
“Brick Like Me,” the much-hyped Lego episode of The Simpsons, comes into this world with several strikes against it already. There’s the very fact of its existence, for a start. Legos are hotter than ever right now, and no matter that the episode starts with a joke at the product placement (“It’s not selling out, it’s co-branding! Co-branding!”) and literally wheels out a later one about The Lego Movie, the baldness of the cash-grab doesn’t precisely scream artistic rigor. Plus, in a season (and, let’s face it, nearly a decade) of creative stagnation on the show, tossing out a lazy gimmick episode is just one more dispiriting nail in The Simpsons’ legacy, right? Instead, “Brick Like Me” is a miracle of an episode, a heartfelt, inventive, exquisitely performed, and tightly written half-hour that reinforces what I’ve been saying all season—there’s no reason why The Simpsons can’t be good again. In structure, it’s similar to this year’s Community episode “G.I. Jeff,” with the action being told through the addled perception of the main character who hallucinates an alternate reality thanks to some brain-rattling event (booze and shady youth pills on Community, a head bonk from a suspiciously large-breasted Katniss-esque Lego statue here). In each case, the protagonist flees from a real-world conflict into a childish fantasyland to escape the problem, only to see reality traumatically reasserting itself as the constructed reality struggles to keep its hold on him. And eventually both wrench themselves free of the fantasy to return to the more complicated real world, having learned something about themselves in the process. But, as much as I liked “G.I. Jeff,” “Brick Like Me” does a better job integrating the gimmick into the greater narrative with an admirable simplicity of plot which—apologies—just snaps together perfectly. 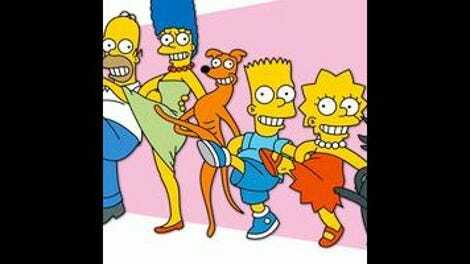 This admirable unity is credited to writers Matt Salman and Brian Kelly, who ground all the brand-name silliness in the enduringly touching and evocative relationship of Homer and Lisa, while incorporating Bart’s seemingly isolated B-story. After watching a season’s worth of lazy and often indifferent Simpsons plotting, the level of ambition and the ease with which all the elements come together in the end here is like seeing Kirk Gibson hobble up to the plate and belt out an improbable homer off Dennis Eckersley in the 1988 World Series. Honestly, it’s just such a relief to be able to write something positive about The Simpsons for a change. Once “real” Homer discovers that playing Legos with Lisa is actually fun—and not the sort of forced, patronizing “fun” time that parents have to spend having tea parties, playing hide-and-seek “with flagrant peeking,” and Candyland (“the most inhumane torture ever devised by man”)—their relationship takes its rightful place as the episode’s true center. The Homer/Lisa pairing has always been my favorite on The Simpsons, mainly due to how it captures the essential father/child disconnect. Homer and Lisa have nothing in common, their disparities in age, maturity, and intelligence (Lisa wins the last two) forcing them to try constantly to find some common ground. When they do (“Lisa The Greek,” “Lisa’s Substitute”), the strength of that improbable bond is deeply affecting, and here both their shared enthusiasm for their model Springfield and Homer’s sadness at the thought that Lisa has suddenly outgrown it comes across feelingly. Much of the credit goes to Dan Castellaneta and Yeardley Smith, each of whom throws themselves into their roles with a commitment admirable for such a theoretically gimmicky episode. When Homer is explaining the hard truth that parents often humor their kids’ childish enthusiasms, it’s typically insensitive Homer (seen again when he enthuses later, “I can’t believe all the time I wasted playing with Bart when I could have been playing with you!”), but it’s also touching how Homer speaks to Lisa like an equal, because they’ve found something they have in common. It’s not great parenting, but it’s still something Lisa responds to because she’s being treated like a person by her dad. That balance of heart and inappropriateness is Homer’s sweet spot, and Castellanata keeps knocking it out of the park all episode. The repeated mantra of the Lego Springfield is “everything fits with everything else and nobody ever gets hurt,” and if there’s a better encapsulation of how we’d all like our lives to be, I haven’t heard it. Certainly not this week on TV anyway. So when Lisa, seduced away from their planned outing to a Lego competition by the attentions of some slightly older girls who appreciate Lisa’s understanding that their beloved Hunger Games-esque books “are really about love,” bails on him, the stage is set for Homer’s fantasy. Homer’s got Legos on the brain, so his escape into a Lego-themed world (after being brained by some Legos) just makes perfect sense. His perfect world is one where Lisa never will outgrow him—it’s moving how simple and right it all is. Plus, he gets to knock police helicopters out of the sky with a parking meter without getting in trouble. That deceptively effortless unity of storytelling extends to Bart’s story. In such a world of easy and consequence-less destruction, Bart should thrive, but his skunk-related spree which knocks the school down to its component bricks sees him sidelined by Skinner. Forced to reconstruct the school according to the boring booklet instructions, Bart instead does what all right-thinking kids do and reconfigures Springfield Elementary according to the whimsical dictates of his childish imagination, complete with skate ramps, Terminator gym teachers, Skinner’s office as a haunted forest (with extra ghosts), and two, count ‘em two, tetherball poles. When Skinner demands he reconfigure the school back into the “kid jail” design, Bart’s objection that he used all the same bricks in making his version deftly encapsulates the conflict he continually finds himself in. And when he caves in, saying dejectedly, “I’ll never build what I want again,” and Skinner responds with a delighted, “Then you’ve learned your lesson!,” again, the battle between childlike imagination and the forces of standardization are illustrated with subtle clarity. Homer’s decision to leave this perfect but static world made of unchanging plastic arises from his realization that the joy that comes from playing with children is the knowledge that they’re not going to be children forever. As Homer puts it with admirable simplicity, “The fact that kids grow up is what makes time with them special.” Of course, the moment is layered with the fact that, after 25 years, none of the Simpsons children have aged a single day, which is actually sort of sad if you think about it. Thankfully, as the final Time Bandits tag shows, there are fictions inside of fictions, and if Homer has escaped from one into another, at least he (and maybe we) will never know it. My one real complaint is that the Time Bandits capper should have ended the episode. Making fun of The Hunger Games is fun and all (the name “Joshuel” encapsulates everything about the franchise that sets my teeth on edge), but this was a startlingly well-realized episode before then, and should have ended when Homer’s story did. Plus, how cool would it have been if the credits played over the whole of George Harrison’s rousing “Dream Away,” instead of just using the intro? Homer and Lisa’s model Springfield includes the weird-smelling bank, and the Krusty Burger where the governor got stabbed. Maggie is made of age-appropriate Duplo. The different ratings on the love tester machine at Moe’s are oddly disturbing. Call it shameless pandering if you like, but Homer’s not wrong when he says that playing Legos with a little kid is far preferable to the other things those little weirdoes seem to find entertaining. I like the way that liquids (skunk spray, water from the tap) are visualized by a tumble of those single-peg transparent Legos. Homer’s terrified, “pajama guys!” when he sees the ninjas is great Homer comedy. I hate puns, but the inscription on Lego Jebediah Springfield’s statue (“A noble spirit enbrickens the mini-est fig”) is actually kind of touching in context. Executive producer Al Jean claims that the whole Lego thing is just a coincidence. With the long development time for an episode of the show (and the fact that I want it to be true), I’m gonna choose to believe him. One other reason to think this might not be a complete cash-grab is that the Simpsons figures in the episode are not the ones that are commercially available. If that Time Bandits bit featured the four-fingered God hands instead of the clampy Lego ones, what would that mean? Or did I just blow your mind?